The STOKE is powerful, precise and super-responsive. A superb bar feel gives you full control to throw big loops, shred massive waves or unleash its explosive pop. An easy choice for riders who like unhooked-freestyle, wave riding or gnarly big airs. 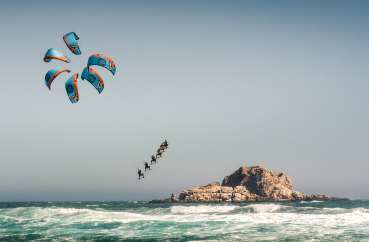 Try the most radical FLYSURFER kite... share the stoke! The 3-Stage Simple Bridle gives you access to an Open-C shape freestyle kite or a super-responsive freeride kite with good drift. Kite speed, bar pressure and steering force is a matter of choice. Simply adjust the STOKE to your personal preferences. Ride the way you love it. Wave Mode: We recommend the Surf Mode for riders who enjoy riding big waves or strong winds. This setting gives the kite more depower and increased bar force. Freeride Mode: This setting covers a large wind range, offers great stability, responsive turning and is perfect for kiteloops. We recommend the Freeride Mode for your big air session. Freestyle Mode: If you want an explosive pop and great line slack for unhooked moves, choose the Freestyle Mode! The Power Transmission Surface gives the STOKE its incredible responsiveness and allows very precise control. The fork bridle on the leading edge transfers the steering command very efficiently to the kite. 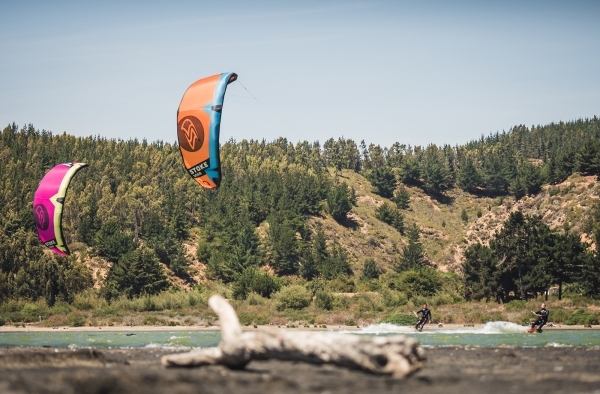 The power is transmitted directly into the sail, the kite reacts immediately to the rider and creates a super constant pull throughout a kite loop. 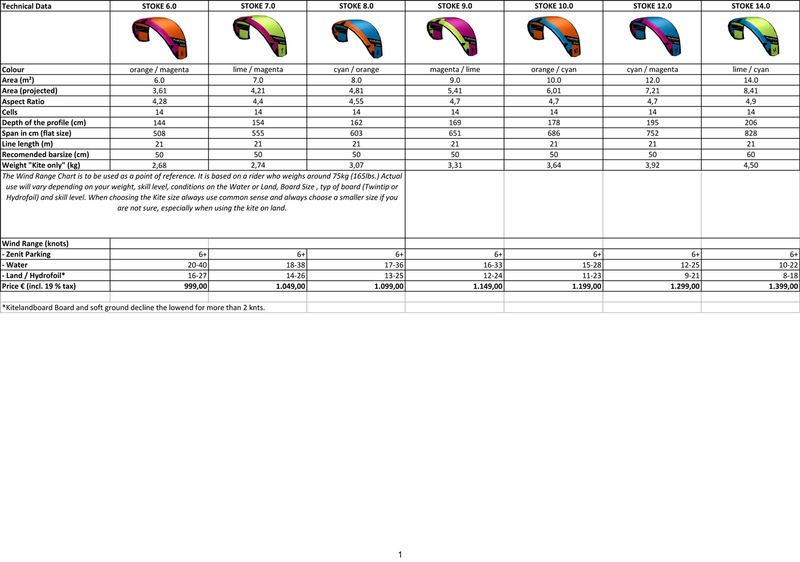 The high load force frame sets the standard for FLYSURFER Kiteboarding L.E.I. kites and provides the necessary structure to keep the kite extremely rigid. We only use high quality materials such as Polyant 175LL Dacron for the front tube and struts and Teijin TECHNOFORCE D2 for the canopy. The materials are sewn together by a densely woven, high strength fiber from DuPont, which is fixed and tempered with resin. This creates a stable frame offering the smallest elongation (stretch), high tear strength, no moisture absorption, very good UV resistance and almost no deformation of the kite even at maximum load. 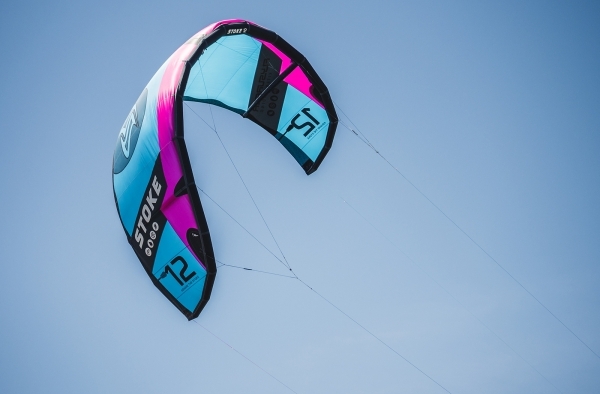 The optimized shape of the High Load Force Frame results in a clear, clean air flow that improves the overall performance of the kite, its depower and flight stability. With the reworked Self Launcher, we are offering you a tool to easily solo-launch the STOKE. Position the kite at the edge of the wind window, connect the sandbag (which comes with the kite), or any other bag and place this on the ground. Once the kite lines are tensioned the Self Launcher automatically releases safely at just the right moment. Perfectly balanced performance in any wind conditions. The lighter weight construction and higher aspect ratio of the 14.0m STOKE makes it a solid light wind machine for freestyle riders. At the other end of the spectrum the 6.0 and 7.0m STOKE are designed for strong winds – they feature a reduced aspect ratio and thicker lines, improving safety and creating a kite you can trust in gnarly strong winds.